Listen to Dana’s LA Scoop played by Jon E. Love at the Key Club In Hollywood 12/15/12! My great grandfather gave me a bass guitar around 5 years ago and I cannot find any information about it. I’ve searched high and low on the internet and even been to several music stores and pawn shops and no one can give me info on it. It has your name on it, so maybe you can help? It is a four string bass, it says Alvarez Dana series on it and the only thing I can find out about it is, it’s circa ’91-’92 and it’s said to be from their offset series. It has active pickups and a custom fit hard case, 3 way channel selector, 2 tones, 1 volume it plays and sounds amazing! I love it, I just wanna know more about it and what the thing is worth. Could you please help me with any information? It would be greatly appreciated!!! The bass was made in late 1991 or all of 1992. It was called the Alvarez Dana Offset bass. The active tone controls are a 3Khz treble cut and boost and a 125hz bass cut and boost. Half way up is flat on both controls. The body is made of sugar maple. The neck is hard rock maple and SE Asian rosewood. All Dana basses are rare. Most in mint condition sell for over 500.00. The retail was 999.00 in 1991. The radical body shape was replaced with softer edges and corners in 1993. Still called the Offset bass. If you need more information please let me know. I offer restoration packages on all Dana guitars over 20 years old. There are bad accidents and there are good, or “happy” accidents. Bad ones are when you bend over, your rear-end knocks over your axe, and suddenly you’ve “created” a headless guitar. An example of a happy accident is the invention of the Alvarez Dana Scoop. As a brand, Alvarez was a name originally used by St. Louis Music (SLM) for its Japanese-made acoustic guitars beginning in 1966; Alvarez-Yairi models were built in Kazuo Yairi’s workshop, while Alvarez models were built elsewhere. Beginning around 1970 – maybe slightly earlier – SLM began importing electric guitars from Japan bearing the Electra brand. Many were made by the legendary Matsumoku Moto plant. In ’83, SLM entered into a joint venture with Matsumoku, and in ’84 transitioned the Alvarez brand to Westone, which had previously been used by the Japanese manufacturer. Matsumoku had started as a builder of sewing machine cabinets, and in ’87, the company was purchased by Singer Sewing Machines. It’s not entirely clear, but Matsumoku may have continued making guitars until 1990. With it went the Westone brand, and SLM’s electric line became Alvarez. During this period, SLM began moving some production to Cort, in Korea. “Dana” is Dana Sutcliffe, who at age 13 got a guitar with four of the worst pickups ever made. So he set about making his own replacements. Thus began a lifelong interest in electronics, and his subsequent experience with guitars eventually landed him a job at the ill-fated Renaissance guitars. There, in 1978 or ’79, under the supervision of John Marshall, Sutcliffe earned a master’s degree in lutherie. Following the Renaissance experience, Sutcliffe began repairing guitars, building custom guitars, and developing more pickups, including the active units that would make him famous. He did a lot of work converting Gibson guitars for use by Delaware rocker George Thorogood. One of the people who called on him was the local sales rep for SLM, a non-musician who would seek help in adjusting the settings on his Crate amps. Sutcliffe would use a guitar with his pickups, but the rep returned red-faced, claiming Les Pauls and Strats didn’t sound good at those settings. So Sutcliffe started using those guitars while testing the amps. But it was this sales rep who alerted Tom Presley, guitar-brand manager at SLM, to Sutcliffe and his hot pickups, circa 1987. A relationship between Dana and SLM ensued, and by ’88, Sutcliffe had his own “line” of Dana Westones outfitted in his shop with his electronics. That was when the happy accident occured. In ’88, one of Sutcliffe’s employees was operating a pin router while working on a Matsumoku-made Westone body. The router hit a knot in the wood near the treble cutaway, damaging the body, which was then set aside. But overnight, another employee put a neck on it. The next day, it became the joke/”gash” guitar. Sutcliffe picked it up, played it, and hear amazing first – and – second string tone with no phase cancelation. He worked with it a little, including expanding the gash – and the Dana Scoop was born. As he experimented more, he discovered that the resonance he wanted only happened when the scoop appeared at the 24th fret. Since his guitars were part of the SLM Westone line, Sutcliffe regularly attended the NAMM shows as part of SLM’s displays. 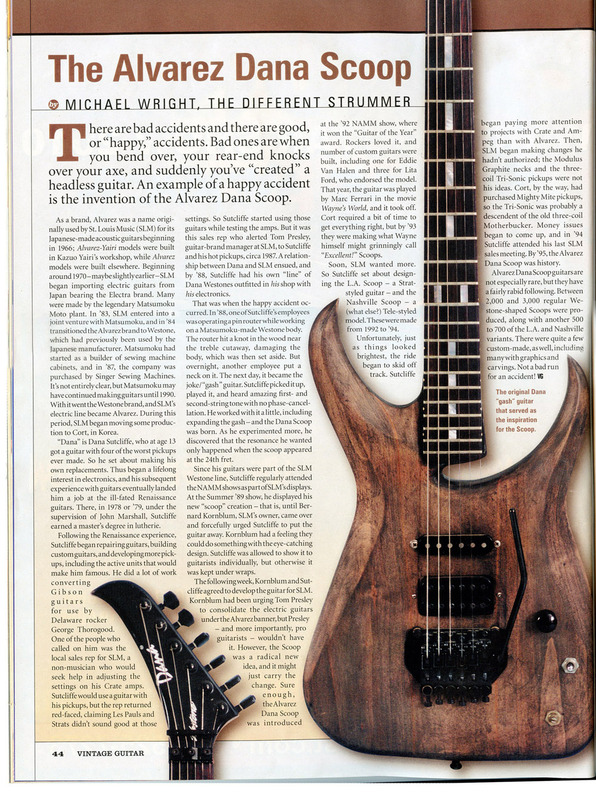 At the Summer ’89 show, he displayed his new “scoop” creation – that is, until Bernard Kornblum, SLM’s owner, came over and forcefully urged Sutcliffe to put the guitar away. Kornblum had a feeling they could do something with the eye-catching design. Sutcliffe was allowed to show it to guitarists individually, but otherwise it was kept under wraps. The following week, Kornblum and Sutcliffe agreed to develop the guitar for SLM. Kornblum had been urging Tom Presley to consolidate the electric guitars under the Alvarez banner, but Presley – and more importantly, pro guitarists – wouldn’t have it. However, the Scoop was a radical new idea, and it might just carry the change. 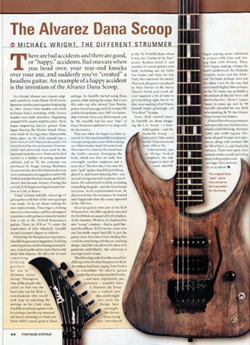 Sure enough, the Alvarez Dana Scoop was introduced at the ’92 NAMM show, where it won the “Guitar of the Year” award. Rockers loved it, and a number of custom guitars were built, including one for Eddie Van Halen and three for Lita Ford, who endorsed the model. That year, the guitar was played by Marc Ferrari in the movie Wayne’s World, and it took off. Cort required a bit of time to get everything right, but by ’93 they were making what Wayne himself might grinningly call “Excellent!” Scoops. Soon, SLM wanted more. So Sutcliffe set about designing the L.A. Scoop – a Strat-styled guitar – and the Nashville Scoop – a (what else?) Tele-styled model. These were made from 1992 – ’94. Unfortunately, just as things looked brightest, the ride began to skid off track. Sutcliffe began paying more attention to projects with Crate and Ampeg than with Alvarez. Then, SLM began making changes he hadn’t authorized; the Modulus Graphite necks and the three-coil Tri-Sonic pickups were not his ideas. Cort, by the way, had purchased Mighty Mite pickups, so the Tri-Sonic was probably a descendent of the three-coil Motherbucker. Money issues began to come up, and in ’94 Sutcliffe attended his last SLM sales meeting. By ’95, the Alvarez Dana Scoop was history. Alvarez Dana Scoop guitars are not especially rare, but they have a fairly rabid following. Between 2,000 and 3,000 regular Westone-shaped Scoops were produced, along with another 500 to 700 of the L.A. and Nashville variants. There were quite a few custom-made, as well, including many with graphics and carvings. Not a bad run for an accident!